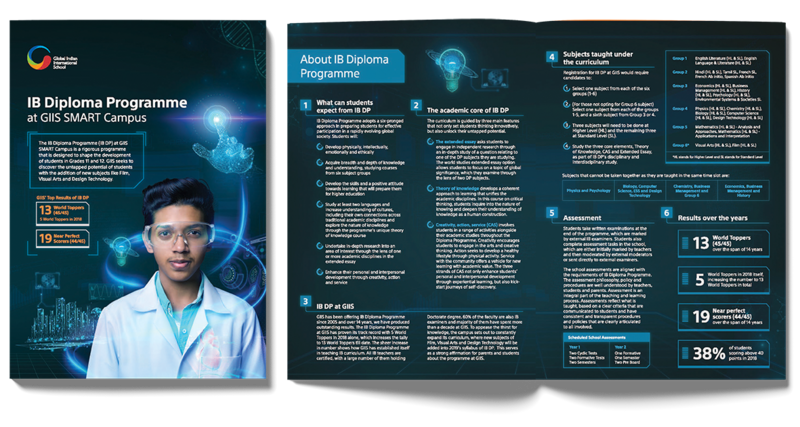 The International Baccalaureate Diploma Programme (IBDP) at GIIS is a comprehensive two-year international curriculum undertaken by students after completion of Class 10, ‘O’ Levels, or equivalent. Designed for highly motivated secondary school students aged 16 to 19 years, this rigourous course of study provides balanced academic exposure, lays the foundation for university life, and is a pathway to the world’s leading universities. The IBDP aims to produce students not just with an excellent breadth and depth of knowledge, but also with the skills to succeed physically, intellectually, emotionally, and ethically. Theory of Knowledge (TOK), which examines types, nature, and limitations of different ways of learning and different areas of knowledge. Extended Essay, an in-depth study of a limited topic within a subject which provides students the opportunity to conduct independent research in order to produce a successful essay. Creativity, Action and Service (CAS), which complements the academic disciplines of the IBDP curriculum, and meets the mission statement of GIIS to nurture all-round citizens for tomorrow through everything from service projects to physical training. Through the DP core, students have the opportunity to reflect on the knowledge gained, conduct independent research, and undertake community service projects. Graduates go on to secure placements at the world’s most prestigious universities, including the University of Oxford, New York University, National Institutes of Technology (India), National University of Singapore, Nanyang Technological University, University of California at Berkeley, London School of Economics, and many other leading global institutions. GIIS IB Diploma students raised the bar once again by their brilliant performance in 2018. At GIIS, we hold a large variety of events to help you learn more about the academic programs, admission process, campus tour, value added learning opportunities and many more. Click on the link for more information to find out more! Limited seats available on a first-come, first-served basis.